We need your help. Our Aussie Friends at Murdoch University are finalists for the Google Impact Challenge. They need our votes to help them win a million bucks for dugongs and seagrass. Its easy to vote, just click here and go vote. 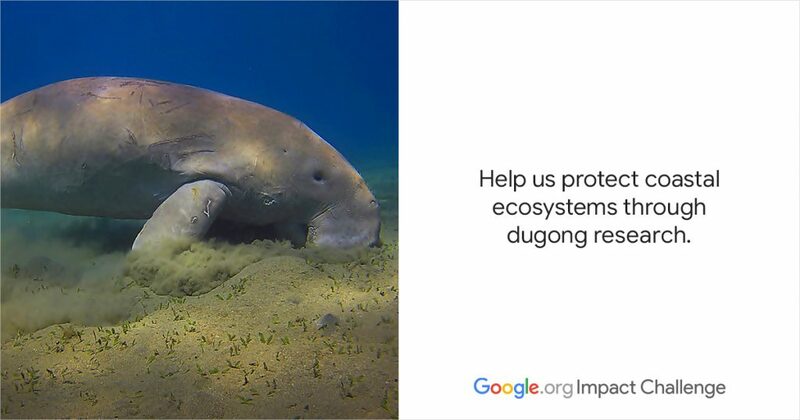 With your help we can win a million bucks to monitor dugongs and seagrass in a totally new and exciting way. Here is a banner from Murdoch University, You can click it to go vote, too. Click Image and Go Vote! Seagrass meadows, which support half the world’s fisheries and feed 3 billion people, have been vanishing at a rate of 7% per year with an estimated 35% lost already. Dugongs – marine mammals that range across 46 countries and feed exclusively on seagrass – can be used as markers to map these underwater ecosystems. Current efforts to locate dugong populations require experts to fly small airplanes in remote areas, which is costly and dangerous. Dugong Detector instead pairs inexpensive, user-friendly, camera-equipped drones with artificial intelligence programs that can recognise dugongs in photographs. By advancing this technology to improve detection rates, map different aspects of marine environments, and integrate information from users around the world, this project will enable researchers and communities to pool their efforts to monitor and protect essential ocean resources. Thank you! Oh, and did we say go vote?